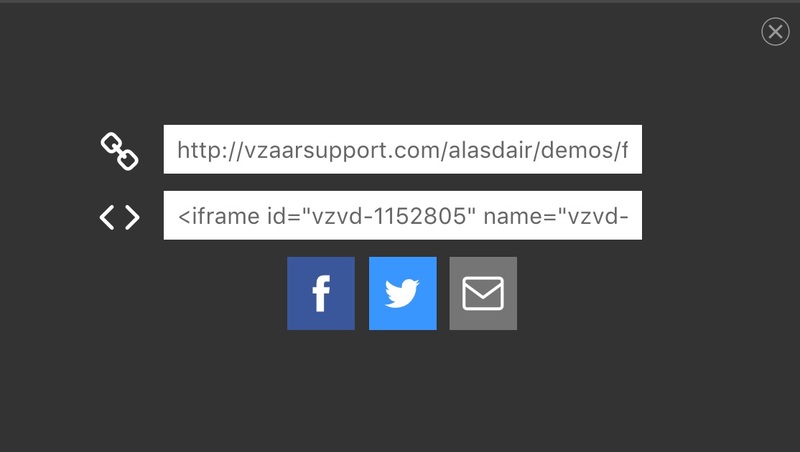 Allow your viewers to share and download your video, directly from the vzaar video player by enabling our new social sharing tools. Split into three areas of social sharing, you can turn on each tool individually, or enable all three. You can find these on your settings page, under the Behavior & Controls tab. If you'd prefer to link to a page on your site where you've embedded the video, you may specify a custom link for social sharing for each individual videos. Click on the 'manage' button on your video list page video and enter in a URL into the field entitled "video URL on your website." Enabling this will allow your viewers to download a copy of the MP4 file to their hard drive. Lastly, this tool gives your viewers access to the HTML embed code to your video, allowing them to embed the video else where. Note: On some mobile operating systems (e.g. iOS) on smaller-screen devices (e.g. iPhone) the OS mandates that the video play full-screen in the native player. When the vzaar player is bypassed in this way, certain features such as branding and social sharing are not available. Also, the download feature will not work if Password Protection is enabled.